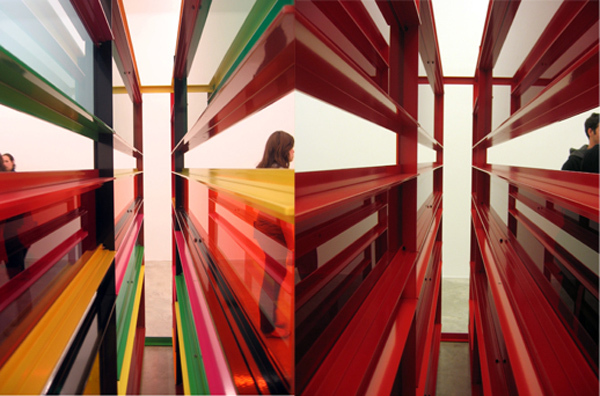 Yes siree, three of my favorite elements all combined by one artist: Liam Gillick. The British artist is based both in London and New York. He has published a number of texts that function in parallel to his artwork, and the artwork itself often incorporates typography. In addition to Gillick‘s installations, he has collaborated with architects on the façades and interiors of many buildings including the Fairmont Pacific Rim Hotel in Vancouver, Canada (see our Architypeture II post) and the Marsham Street Home Office in London. Gillick’s installations are at once minimalist, conceptual and ironic. They are often seen as abstract representations of the various social projects that he participates in. Definitely would love to see one of these in person. This entry was posted in Art, Graphic Design, Industrial Design, Stuff We Like. Bookmark the permalink.